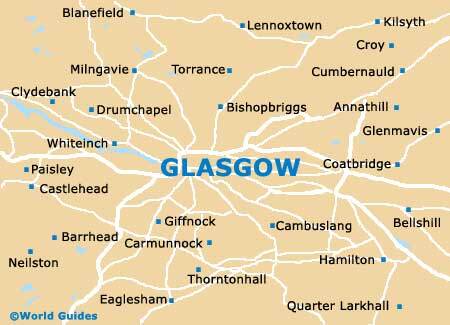 Glasgow is a busy and popular tourist destination in Scotland, and if you are planning to visit this city in July or August, it is very likely that you will have great difficulty finding decent accommodation during those months. Even outside of the peak summer period, hotels in Glasgow are often fully booked at weekends, and so it is always sensible to book any lodging well ahead of your arrival. There is some very affordable accommodation spread around the city, with budget travellers favouring the Glasgow Youth Hostel on Park Terrace, which is located within the historic West End district and enjoys views across Kelvingrove Park. Another popular alternative to hotels in the summer are the self-catering flats and B&B lodging available at the University of Strathclyde Campus Village on Rottenrow East, opposite the city's cathedral. Mid-range accommodation is plentiful around Glasgow city centre, with both guest houses and hotels being found along roads such as Bath Street, Blackfriars Street, Hope Street, McPhater Street and Renfrew Street. Visitors who favour popular chains will find plenty of hotels to choose between in the city. Reliable choices include the Best Western on Elmbank Street, the Express by Holiday Inn Riverside on Stockwell Street, the Millennium Hotel on George Square, the Ramada on Ingram Street, or the Thistle Hotel on Cambridge Street. For luxury accommodation in Glasgow, consider staying at either the five-star Hilton on William Street, or at the surprisingly affordable Radisson Blu on Argyle Street. If you are looking to stay close to the Glasgow International Airport, near to the towns of both Renfrew and Paisley, then the Holiday Inn Express Glasgow Airport is amongst the best hotels on offer, being situated on St. Andrews Drive and within easy walking distance of the terminal building itself.